Scientific Name: Naja naja. Other Common Names: Indian Cobra. · The common cobra is usually brown or black in colour. · It is a distinctive snake growing up to 5 to 6 feet in length, with a distensible neck that can be expanded into a hood (Fig 12.1). On the dorsal side of the hood, there may be a monocellate (monocle) or binocellate (spectacle) mark (Fig 12.2). o The former is more common in the Bengal cobra (Najakaouthia). The monocellate cobra is generally brownor black, with speckled or variegated, white or pale yellow appearance (Fig 12.3). It often has alternate wide and narrow, transverse, dark bands. Dorsal hood mark is a pale circle edged with black and has 1 to 3 spots; ventral hood mark has a pair of dark spots, or a wide dark band. o Another variety of cobra that is encountered in the Indian sub-continent is the Andaman cobra (Najasagittifera). · The hood markings distinguish the cobra from other species, and its habit of rearing up when alarmed make it distinctive but not definitive, as other species do this, notably the Trinket Snake. stripes above which are two dark spots that extend over 3 to 4 scales. · The head is small, and pupils are round. · The most important distinguishing feature of this snake is the fact that the 3rd supralabial shield touches the eye and nose shield. Also, a small wedge-shaped scale (“cuneate”) is present between the 4th and 5th infralabials. Another important feature is said to be the presence of 3 small scales just behind each eye. · Grassy plains, fields, and mountainous regions (up to 15000 feet). They usually reside among piles of bricks, termite mounds, tangles of roots at the base of trees, and old masonry constructions. · The spectacled cobra is encountered virtually over the whole of mainland India except the north-east. 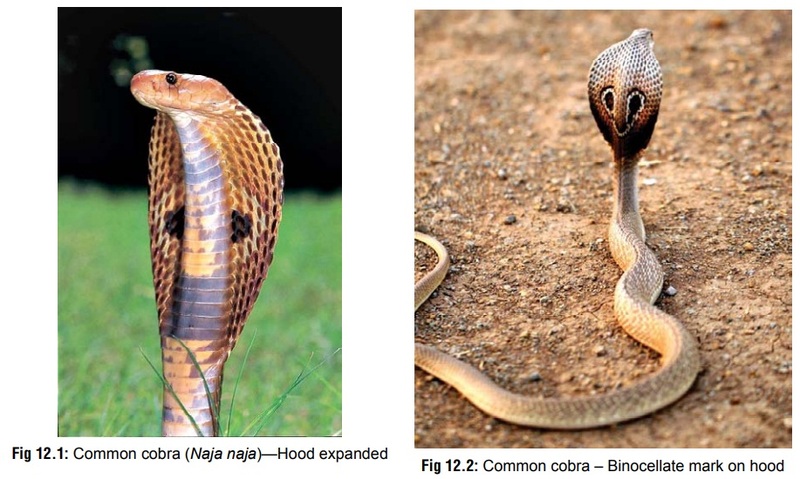 · The black cobra (Naja oxiana) (Fig 12.4) occurs in the extreme north of India around Jammu and Kashmir, and also in Gujarat and Rajasthan, although these may be patternless versions of the spectacled cobra. · The cobra is diurnal, but bites from cobras occur during both the day and the night. The cobra’s principal diet is rats. It is known to enter human habitations in search of prey.